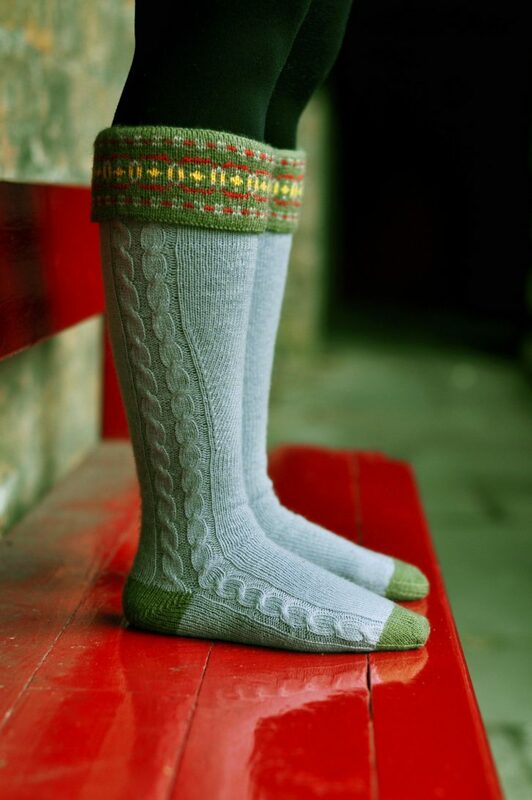 These vintage-style socks are named after the little-known children’s book, ‘By a Silver Stream’. My father loved this novel as a child, and kept it into adulthood to share the delight with his own children. The book, one of a series by Elleston Trevor, is about the everyday lives and adventures of some very cute woodland creatures. To this day I smile to remember the two over-enthusiastic and argumentative mice! The socks begin with a provisional cast-on with waste yarn that is later removed, resulting in a double-layered foldover cuff. To fit up to 30½(35½:40½:45½:51)cm/ 12(14:16:18:20)” calf circumference and 18(20½:23:25½:28)cm/7(8:9:10:11)” mid-foot circumference. The pattern is designed to be customized for a range of ‘mix and match’ calf and foot circumferences. 5 colours of 4 ply sock yarn with approximately 410 metres/448 yards per 100g (205 metres/224 yards per 50g). You will need 100g of main colour (MC) and 50g each of 4 contrast colours (CC). The pictured sample was knitted with Cygnet ‘Wool Rich’ in Dove Grey #130 (MC) with Olive #0268 (CC1), Oatmeal #246 (CC2), Rust #2150 (CC3) and Yellow #2041 (CC4). 2.25mm/US 1 and 2.75mm/US 2 needles for your preferred method of small diameter circular knitting. Adjust needle size to achieve the specified tension/gauge. 32 sts and 38 rounds per 10cm/4 inches in st-st on smaller needles after blocking).